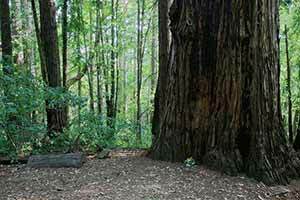 Henry Cowell’s redwood grove is the only remaining old-growth grove in the Santa Cruz area and is an intriguing glimpse into what the region’s extensive redwood forests might have once looked like. 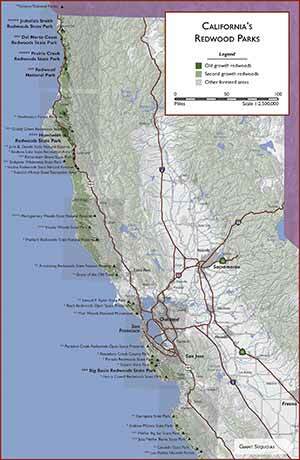 The grove is on an alluvial flat just south of the logging town of Felton. 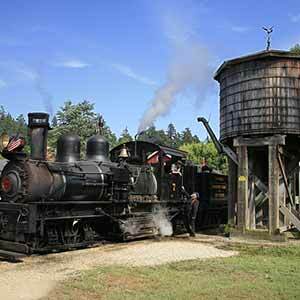 Besides the 0.8-mile loop trail, the Roaring Camp Railroad passes through the grove, and the silence of the redwoods is often pierced by the loud hoots of steam trains. In many ways the grove has a typical old-growth feel; it’s remarkably cool and lush, with a groundcover of ferns and redwood sorrel, and there’s a characteristic hush from all the sound-dampening foliage. 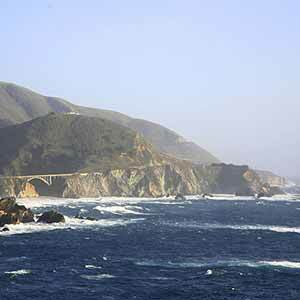 However, typically for southern groves near the ocean, there aren’t a lot of big redwoods here, and an unusual number of the trees are oddly mishhapen. 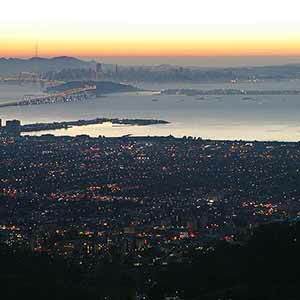 Also, mixed in with the redwoods is a thick understory of tanoak and bay trees that obscures the redwoods and makes the grove look like a dense deciduous forest. 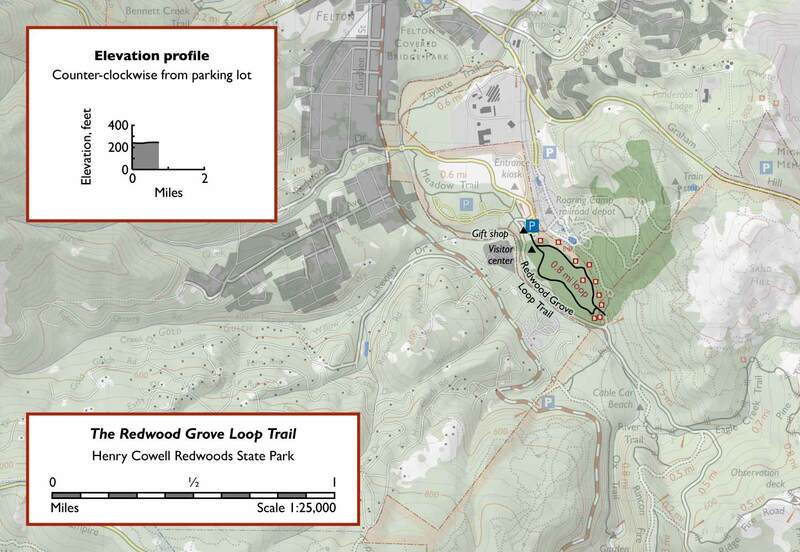 The broadleaf growth is densest within the redwood loop; the old growth just outside the loop is much more open, suggesting that the grove’s appearance may be partly the result of fire suppression or other land management practices. 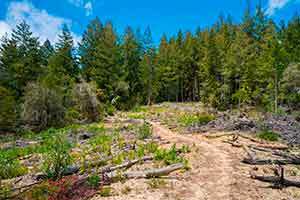 Compared to nearby Big Basin, the Cowell grove is more lush but less redwood-dominated; Big Basin has more impressive redwoods and feels more wild. 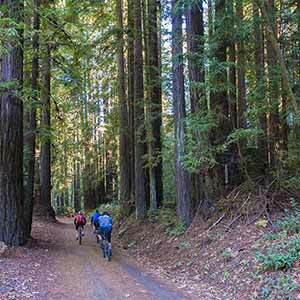 Nontheless, Henry Cowell is still a good place to appreciate an old-growth forest, especially since the grove acts as a gateway to the San Lorenzo River and second-growth forest hikes. 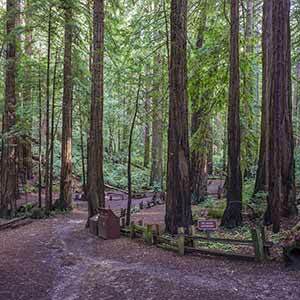 Although some of the second-growth areas of the park are quite pleasant, passing through the big redwoods makes you appreciate the grandeur and the special beauty of old growth forests. 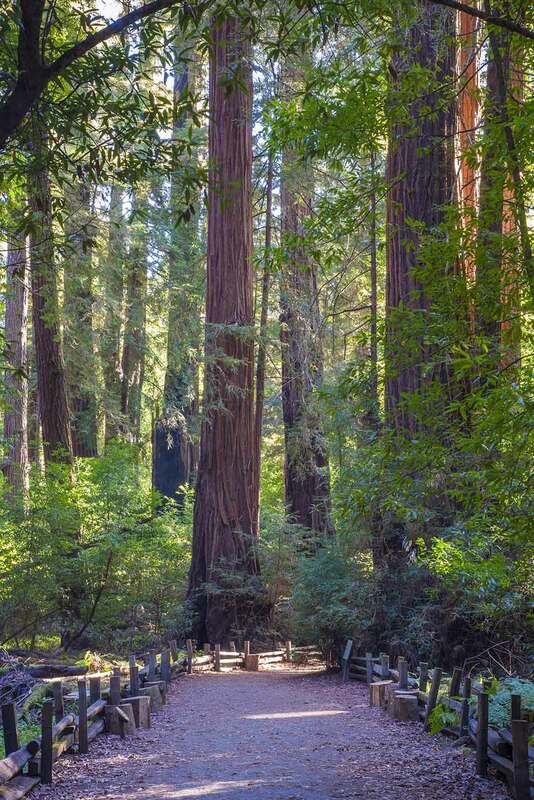 The old growth was the first coast redwood grove to be saved from logging, having been purchased in 1867 by San Francisco entrepreneur Joseph Welch. A sawmill had existed near the grove since 1841, but the town of Felton and the railroad had not yet been built. 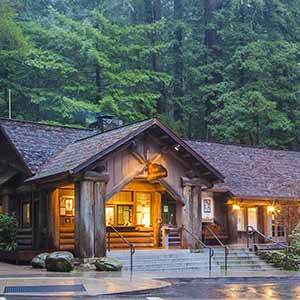 Welch’s Big Trees Resort remained in operation until Santa Cruz County purchased the resort in 1930. In 1952, the Cowell family donated the adjacent land, which had been logged to support the nearby lime kilns, to the state. Just across the railroad tracks from the Loop Trail is the little-known Indian Creek Nature Trail. About a quarter-mile of this bumpy dirt road passes through old-growth redwoods (the other, rather unspectacular, quarter-mile connects to the Roaring Camp train station). 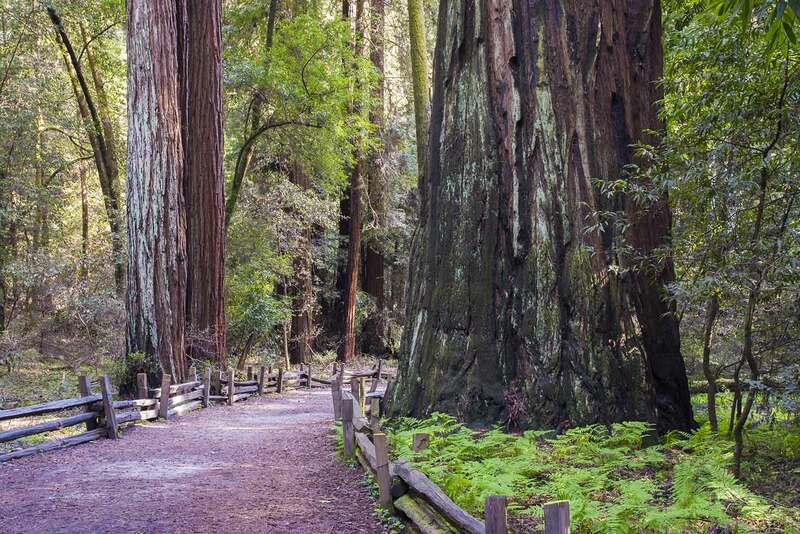 These redwoods are owned by the Cowell Foundation and were part of Welch’s Big Trees resort until the railroad split the old-growth grove in two. 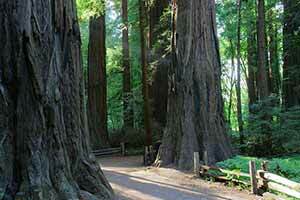 The redwoods are more dominant here and the tanoak understory is not as dense. 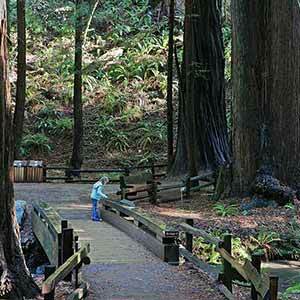 There’s also a small grove of old-growth redwoods in the Roaring Camp area. 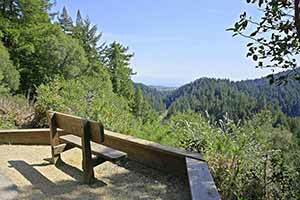 From the pathway that connects the Henry Cowell parking lot to Roaring Camp, walk directly east along the gravel path for about 100 yards, crossing the tracks to reach a picnic area under a dense forest. 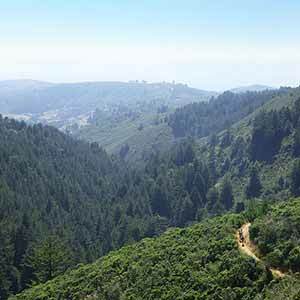 From here, an unmarked trail leads uphill for a few yards through some large redwoods. It’s also worth a short detour to see the San Lorenzo River: at the south end of the loop trail, look for a gated dirt road. The road leads a few yards to an attractive spot where a railroad bridge crosses the lushly-vegetated river.